Thank you for your letter. I enclose three samples of pure deoxyribonucleotides which I hope may be useful to you. I do not know whether we have sent enough or not, but you can let us know the position about that. Two of them, thymidine-3' phosphate and thymidine-5' phosphate, are in the form of their barium salts, while the third, deoxycytidine-5' phosphate, is the free acid. I hope to send you some of the fourth member of this group, deoxycytidine-3' phosphate, in a week or two's time, and we will let you have the purine ones later on. We are much looking forward to seeing you at the beginning of April in Cambridge. Dearest girl: I love you. It is odd to be here without you, although Peter helps. He is well and moderately happy. My trip went along all right. The BOAC plane went to Goose Bay. Lots of snow. I saw Riley, who lives in the R.I., but not his wife, who is ill. I am staying with Pop (Mrs Prior), a Cambridge character who runs a boardinghouse. Peter too - Peterhouse is closed. We had lunch today with Bragg, Perutz, Crick, etc; also Lady Bragg, who sends you her regards, + Dorothy + Thomas (just padding through), who send their love. D. will come in Sept. But not T. We visited the labs, + Peter + I have just been walking along the backs. Daffodils are blooming, and trees are coming out. Long underwear useful. Tomorrow we lunch with the Braggs, also dine at Trinity, see Rothchilds in between. Here we are. It's grand and wonderful to see Daddy. Next time, he has to come incognito. Too many social engagements + science. Thank you very much for the surprises + the seat. I guess I had better give Daddy a date. You are a darling mother. My chairs should be ready soon. I think I shall go to Paris Tuesday with Sid. Give Crellin a swat for me. I hear he needs it. I saw the Hodgkins today for the first time. I like them very much. I am excited about seeing you this summer. Letter from LP to W.H. Freeman RE: LP encloses the Final Manuscript of the second edition of General Chemistry. He mentions that he is eager to correct proofs of the book, and then details his travel plans through the summer. [Filed under LP Books: Box 1953b, Folder 1953b.1]. 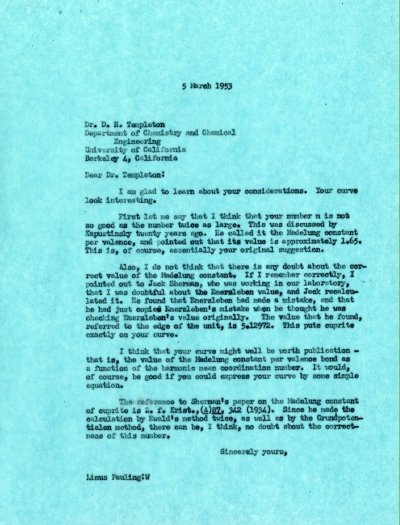 Letter from R. T. Sanderson to LP RE: Requests that LP contribute a letter in commemoration of Prof. Jacob Cornog's retirement from the State University of Iowa. [Letter of response from LP to Prof. R. T. Sanderson March 11, 1953] [Filed under LP Correspondence: Box #379, Folder #1].